Affiliates are our partners and we want them to make money too! That is why we offer the highest marketplace commission percentage. 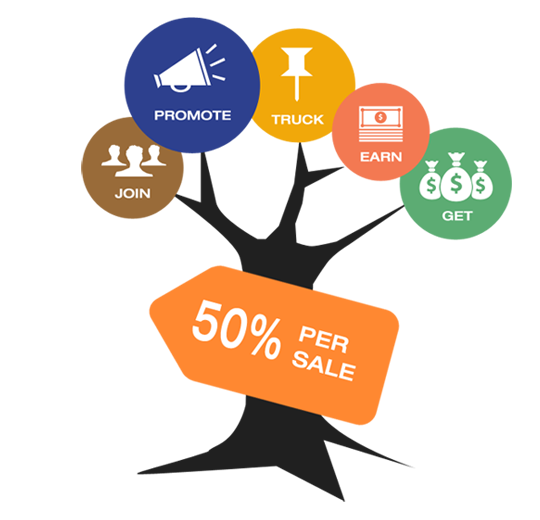 All affiliates will receive 50% net commission for every generated sale on AS marketplace. Limited time we also pay you for every unique click you send our way, the unique click should come from reference page only, it will not be counted if it is done by robots. If the visitor orders (the order doesn't need to be placed during the same browser session - cookies are stored for three months), the order will be registered as a sale for you. Our system will show you your total earnings, how many referrals do you have and notify you when a sale is made. You will receive commission payouts via PayPal on the last day of every month, if your balance is at least $100. Sign up to open AS account or Sign in if you already have one. Click on Become an Affiliate link in your AS profile to recieve your referral ID and $25 signup bonus. Insert the received code on your website and start earning referrals! We are looking for highly motivated web designers, web hosting providers, graphics resellers and any website owners who want to sell our items, products and web design/development services through their own websites. Our system will show you your total earnings and how many referrals do you have. Also our system will notify you when a sale is made. Referrals are paid exclusively via Paypal on the last day of every month, if your balance is at least $100. Try an easy and effective way of attracting more visitors to your website by featuring an amazing Joomla!, WordPress amd HTML collection of our free templates with affiliate links. Remember, the person that downloads it may end up buying product. Promoting our highest priced items, like our Author Clubs. Making showcases on your own is very much appreciated! You can satisfy the needs of the most sophisticated clients by creating your very own collection of templates, just don't forget to link to us in order to generate more traffic and increase your sales! The results will not be long in coming after you start generating good daily traffic to us. Don't underestimate the value of Social media! Blogging, forwarding, and tweeting our products. Tell us what you think! Contact us for any query or assistance that we shall gladly provide! The affiliate (referrer) will earn 50% of comissions receivied by AS Templates marketplace from selling web products and services. The affiliate is not eligible for referral reward if the referred person is already registered with AS Templates. That means the referrer can earn reward only if the user registers with AS Templates after the affiliate refers them. The cookie we use in this affiliate program expires in three months. So, the affiliate (referrer) can earn reward only if the visitor registers within that time. You are not permitted to run campaigns using AS Templates brand, trademark or other intellectual property except the links for affiliate marketing. We don't allow activities that may confuse users or disguise you as endorsed by us. We don't accept any kind of spamming or misleading behavior. When a refund or a chargeback is applied to a purchase that earned the referral will be discounted accordingly. AS Templates reserves the right to modify or explain the terms and conditions of the affiliate program. In any circumstance, AS Templates will make the final decision. Some thieves use stolen credit card numbers to purchase from sites that sell digital/non-tangible irrevocable downloadable products. These thieves are not interested in the goods they buy, but rather in the referrals they will earn as affiliates of the site. Our referral payment system is not fully automated and this allows us to visually check who the new affiliates are, what kind of revenue they generated and how they did it. We are checking our current affiliates regularly and we are considering every transaction when a new affiliate's traffic generates. When a new affiliate arouses suspicion, we will get in touch with the affiliate, placing his account on hold and ask him for more information regarding where he has placed our ads and how he has promoted our site. We will also contact each buyer that bought using his link to make sure they made the purchase. Our system will also tell us when the purchase was made from the same IP address that the affiliate has used. Any affiliate found to be involved in any actions not deemed appropriate by astemplates.com will be terminated immediately and the information will be forwarded to the credit card authorities. In these cases, any unpaid referral earnings will be forfeited.